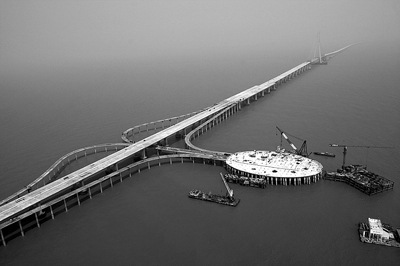 World’s longest sea span bridge, spanning Hangzhou Bay near Shangai is 36 kilo metres long. The bridge connecting Shanghai and Ningbo is going to be opened for traffic soon. The bridge will cut the length of the drive from Shanghai to Ningbo from 400 km to 80 km. This bridge is longer than the existing 32.5 kilo metres Dongai Bridge, which is also in China. Here is the map showing the location of bridge. The bridge is expected to be opened to traffic by end of April. Click here for some photos. Bridge was opened for traffic on May 01. More details and photographs are available at people. A video clip of the fully constructed bridge is here at rian. Here is a video clip of the bridge under construction. Part 1 of 5 part series. Click here to view remaining parts.